If you know someone who thinks tournament golf lacks edge-of-the-seat drama, sit them down in front of "The Players Championship" this week. This one really is better than most. 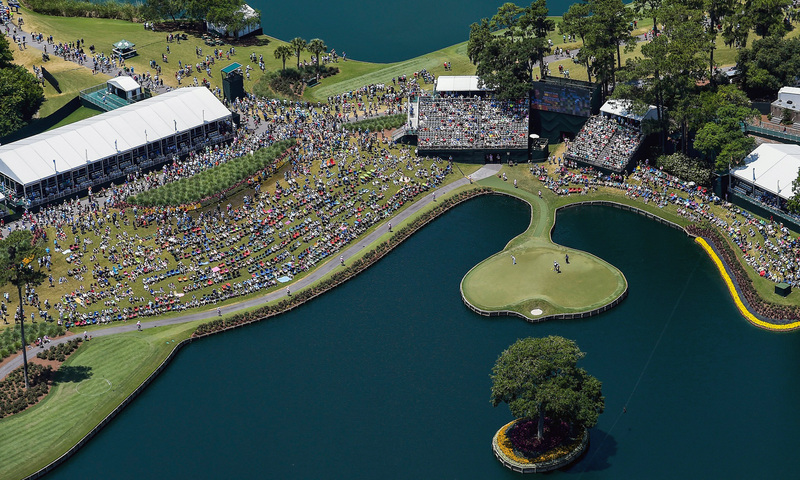 While the famed "Island Green 17th" is enough to make you go weak at the knees, the final three-hole, water-filled stretch at TPC Sawgrass ensures very few leads are ever safe. Although Pete Dye's famed Stadium Course was closed for aerification when we visited, we did at least get to check out some of its most iconic holes and peruse all the memorabilia in the famous clubhouse that is linked to the headquarters of the PGA Tour. Entering the front gates of TPC Sawgrass, PGA Tour flags and sketched faces of all former Players champions align the drive up to the front of the clubhouse. It is a pinch-yourself moment from the word go. Stepping inside the giant double doors of the clubhouse, you are greeted by several giant framed paintings (by artist Bart Forbes) of some of the most iconic moments in the tournament's 41-year history, including Tiger Woods's famous putt on the 17th in 2001. The corridor passes a rather smart Presidents Cup room housing the original trophy in a glass box before coming to a display of winning Players Championship memorabilia. The clubs on show include Woods's Nike five-wood, KJ Choi's TaylorMade R11 driver, Henrik Stenson's Yes! Donna putter, Sergio Garcia's TaylorMade Tour Burner TP driver, Phil Mickelson's Callaway Tour X wedge, Jerry Pate's Wilson 5-iron and Jack Nicklaus's Macgregor driver. After passing a room dedicated to the current Players champion Webb Simpson you walk through a corridor depicting how TPC Sawgrass came to life in 1980 from the dream of then PGA Tour commissioner Deane Beman. Beman overcame the owners of Sawgrass Country Club, who never believed his vision of creating a unique host site for The Players Championship, and commenced work with renowned golf course architect Dye. The course routing, initially sketched on napkins over a chicken dinner between Beman and Dye, was laid out so no two consecutive holes ever played in the same direction. The history tour also reveals how the iconic "Island Green" 17th was originally just designed to feature a small pond near the green, yet it continued to be dug for the valuable sand base found in that area. After the excavation work, nearly all of the area around the green was surrounded by water. Sawgrass's three-hole finishing stretch gets all the attention, and for good reason - more than 1,500 balls have found the water on these holes since 2003. If you are to finish well, however, you will likely need to take advantage of the 16th which has statistically played the easiest hole at Sawgrass for the past 13 years. The hole requires a slight draw off the tee if you want the best chance to reach the green in two shots, with trees guarding the entire left side. Bail out right and you will find sand and be laying up in two - which is maybe not a bad idea. Take too much on with the tee shot and you will be in the pine trees left of the fairway, and more than likely chipping out sideways unless you're Davis Love. Who remembers this shot? While an eagle is a bonus, a birdie is a must. It's arguably the most feared pitching wedge or 9-iron in the game. Finding the green with the tee shot is imperative, of course, but the putt is no bargain either, with severe contours in the middle of the green. Find the wrong side of the slope and you'll have your work cut out for a two-putt. More than 600 balls have ended up in the drink here during the Players since 2003, with anything from 20 to 90 balls drowning during a single tournament. Bob Tway holds the record for the highest score - a 12 in 2005. Take par and run to 18. No hole at Sawgrass has been tougher than the 18th since 2003 - a period where the field is a combined 1,950 over par. Off the tee, you either play safe with a three-wood well to the right, setting up a tough, long second shot, or you challenge the water down the left with a driver and set up a short iron into the green. Lots of players bail into the right rough, but it is dense, and a controlled second shot is not a given. The green is no bargain either, and many players fail to get up and down. With lots of different contours in the green, this is one of the toughest holes to scramble on. Let that sink in once more. 1,950 over par for the past 15 years. Ever played TPC Sawgrass? Are you a fan of the Players Championship? Share your thoughts on our social media channels over on Facebook, Instagram and Twitter. How Many Of These TaylorMade Golf Clubs Have You Owned?